The after-action report from that deployment, "DOE EXERCISE 03-01 JACKAL CAVE," notes the early termination of the exercise because of the terrorist attacks, but finds some useful "strengths and weaknesses" including the need to "[i]ssue secure international cell phones to control members and team leaders." According to the book, the exercise involved more than 500 personnel, 62 aircraft, 420 short tons of cargo, and the CIA as well as a special operations force that would seize a mock nuclear device that the squad would disable. 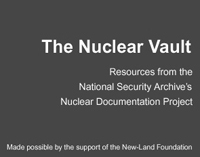 The documents were obtained by Archive Senior Fellow Jeffrey T. Richelson while conducting research for his new book, Defusing Armageddon: Inside NEST, America’s Secret Nuclear Bomb Squad. In the late 1990s the Nuclear Emergency Search Team continued to conduct exercises, which reflected the changes made in the wake of the October 1994 MIRAGE GOLD exercise. (Note 1) The briefing materials and after-action reports for the exercises (Document 1a, Document 1b, Document 2, Document 3) also reflected that the Nuclear Emergency Search Team had become an umbrella term for NEST's various specialized teams, including teams that worked closely with the military. The LINCOLN GOLD Augmentation Team (LGAT) supported U.S. special operations forces (such as Delta Force and other special mission units) while the Joint Technical Operations Team (Document 8) cooperated with the military on disablement and device transportation. In 2002 the name of NEST changed slightly when it became the Nuclear Emergency Support Team (Document 4), which highlighted NEST's role in supporting the FBI with respect to domestic incidents and the Department of State with respect to foreign incidents. By that time, the events of September 11, 2001 – which caught some NEST personnel overseas in the midst of the JACKAL CAVE exercise (Document 3) – had produced heightened concern about a terrorist attack on the U.S. homeland employing either a nuclear device or a radiological dispersal device, more commonly known as a 'dirty bomb.' (Document 9). Osama bin Laden had, as early as 1998, expressed an interest in obtaining nuclear weapons, and material found in Afghanistan supported the view that al-Qaeda was interested in obtaining a nuclear capability. Interrogation of captured al-Qaeda official Abu Zubaydah led to the arrest of American citizen Jose Padilla (Document 5) who, in a meeting with Khalid Sheik Mohammed, had proposed a dirty bomb attack on a U.S. city. Padilla was arrested in May 2002 on his return to the United States. A year later al-Qaeda's interest in nuclear destruction was given a nod of approval by a prominent Saudi cleric in his "A Treatise on the Legal Status of Using Weapons of Mass Destruction Against Infidels" (Document 7). More recently, a U.S. National Intelligence Estimate (Document 18) concluded that al-Qaeda remains interested in acquiring and employing weapons of mass destruction. The concern about terrorist acquisition of weapons of mass destruction, particularly nuclear weapons, has resulted in numerous studies of how a terrorist group might acquire such nuclear weapons or material. A RAND Corporation study (Document 11) consists of three case studies relevant to the issue – one concerning the Japanese group Aum Shinrikyo (responsible for the 1993 sarin gas attack on the Tokyo subway system), another focusing on al-Qaeda, and a third on the theft of nuclear fuel rods from a reactor in Kinshasa. Concern has also manifested itself in the requirement that the National Intelligence Council produce a yearly report (Document 14) on the security of the nuclear weapons of the Russian Ministry of Defense as well as of Russia's civilian nuclear material. In seeking to prevent any acts of nuclear terrorism, the U.S. has sought to develop several layers of defense – of which NEST, the FBI, and military units are the final layer. The preceding layers include materials protection, control and accountability, port of departure screening, at-sea interdiction, Coast Guard inspection, and border protection. Several of these layers represent an attempt to combat nuclear smuggling (Document 13). An organization within the Department of Homeland Security – the Domestic Nuclear Detection Office (DNDO) – is responsible for conceiving and developing much of the architecture, including portals to detect radioactive materials at border crossings (Document 16, Document 19, Document 20). Another DNDO activity, managed through its National Technical Nuclear Forensics Center – is nuclear attribution (Document 21), whose objective, in the event of a nuclear detonation, is to determine the origin of the nuclear material used through analysis of the nuclear fallout and debris – in the hope that such a capability would help dissuade nations that might otherwise be willing to provide nuclear material to terrorist groups. NEST's primary responsibility remains domestic. It was deployed in response to the 9/11 attacks and as a precautionary measure during National Special Security Events, and has also conducted surveillance of selected Muslim sites looking for signs of radiation. But it also still operates overseas – at least once to investigate a ship feared to be carrying radioactive material, and on other occasions, including the 2008 Beijing Olympics, as a precaution. (Note 2) The role of the Department of Energy (that is, NEST and other units) as well as other departments in providing nuclear detection assistance to foreign nations was spelled out in a Department of State-led strategic plan (Document 10) issued in 2004. Document 1a: Department of Energy, "Package SATYR, August 4-7, 1998," n.d. Unclassified. Document 1b: Oak Ridge Institute for Science and Education, "Package SATYR After-Action Report, 4-6 August 1998," November 9, 1998. For Official Use Only/Unclassified Controlled Nuclear Information. These two documents focus on an August 1998 exercise, involving NEST, which was designated Package SATYR. Document 1a, a set of briefing slides, provides an overview of the concept, scenario, and objectives of the exercise, which nominally involved an operation in a foreign nation. The document refers to three NEST elements – the Search Response Team (SRT), the Search Augmentation Team (SAT), and the Nuclear Radiological Advisory Team (NRAT). Document 1b provides more detail on the location, objectives of the exercise as well as the units involved. The conclusions drawn from the exercise are redacted in the released document. Document 2: Oak Ridge Institute for Science and Education, "Exercise Errant Foe, Ellipse Bravo 98 After-Action Report," November 25, 1998. Secret/Pond Stone. This after-action report identifies elements from NEST and other government agencies participating in the exercises as well as the objectives of the exercise. The redacted version also contains a portion of the assessment of the exercise. Reference to certain NEST components – the LINCOLN GOLD Augmentation Team (LGAT) and the Joint Technical Operations Team (JTOT) – indicates the exercise involved NEST support to U.S. special forces (LGAT), and ordnance disposal personnel in disabling and transporting the "nuclear device" (JTOT). Document 3: Oak Ridge Institute for Science and Education, "DOE Exercise 03-01 JACKAL CAVE After-Action Report," n.d. Secret/Focal Point. The JACKAL CAVE exercise, which took place at RAF Fairford, was NEST's first overseas deployment since 1998. As a result of the terrorist attacks on September 11, 2001 the exercise was cancelled and all NEST personnel returned to the U.S. This report identifies NEST elements taking part in the incomplete exercise and provides a number of observations and recommendations. The term Focal Point indicates that the exercises also involved CIA support to U.S. special operations forces. Document 4: National Nuclear Security Administration, "Nuclear Emergency Support Team," 2002. Unclassified. Source: National Nuclear Security Administration, Department of Energy. In 2002 the name of NEST was changed to the Nuclear Emergency Support Team – a change which emphasized NEST's support of the two lead government agencies for nuclear threats and incidents – the Federal Bureau of Investigation (for the investigation of domestic incidents) and the Department of State (for managing assistance to foreign governments). This brochure describes NEST's relationship to the FBI and Department of State, its mission, and how it operates. Document 5: Department of Justice, "Summary of Jose Padilla's Activities With Al-Qaeda," n.d. Unclassified. Jose Padilla, a U.S. citizen, was arrested on May 8, 2002, and designated an "enemy combatant" the following month. The summary recounts Padilla's travels and meetings with senior al-Qaeda officials, with whom he discussed possible terrorist attacks in the United States, including detonation of a 'dirty bomb' – in which radioactive material surrounds conventional explosives, which when detonated make the surrounding area uninhabitable. Subsequently, the Department of Justice decided not to prosecute Padilla on his actions related to his dirty bomb discussions. Document 6: Office of the Assistant Secretary of Defense (Special Operations and Low-Intensity Conflict), Nuclear Terrorism Intelligence: A Special Operations Perspective, September 14, 2002. Secret/Noforn. The briefing, by the senior Defense Department official directly responsible for special operations, includes a review of how several special operations failures (Desert One, Grenada) led to Congressional action, the responsibility of the assistant secretary for special operations and low-intensity conflict, special operations core tasks – particularly those related to nuclear counterterrorism – and issues concerning intelligence support for nuclear counterterrorism. Most of the material concerning the later topic is redacted. Document 7: Nasir Bin Hamd Al-Fahd, "A Treatise on the Legal Status of Using Weapons of Mass Destruction Against Infidels," May 2003. Unclassified. In the 1970s, the question of whether terrorist groups were interested, even if they had the capability, in causing large-scale death and destruction was debated among terrorism experts. Aum Shinrikyo's 1993 chemical attack on the Tokyo subway, according to former senior Clinton administration counterterrorism officials, "pulled the rug out from under one the hallowed verities of counterterrorism – namely, that terrorist groups might want to acquire weapons of mass destruction for the sake of bargaining leverage but would not actually use them." (Note 3) This May 2003 treatise by a prominent Saudi Arabian cleric sanctioned al-Qaeda's desire to obtain and willingness to use nuclear weapons. Document 8: Office of the Inspector General, Department of Energy, DOE/IG 0605, "National Nuclear Security Administration's Ability to Meet the Aircraft Requirements of the Joint Technical Operations Team," June 2003. Unclassified. Despite the increased concern over the nuclear threat from al-Qaeda, NEST still faced a number of resource constraints, including the retirement of physicists with working knowledge of nuclear weaponry. Another constraint involved the availability of equipment. This Energy Department report focuses on shortfalls with regard to the availability of aircraft for the Joint Technical Operations Team component of NEST. It also distinguishes between the two phases of a JTOT deployment. Document 9: Jonathan Medalia, Congressional Research Service, Terrorist 'Dirty Bombs': A Brief Primer, April 1, 2004, Unclassified. This brief primer discusses assorted technical aspects of a dirty bomb (radiation, biological effects, sources of radioactive material), the design and effectiveness of such a bomb, and prevention and response (securing radioactive sources, avoiding the use of radioactive sources, detection, steps to minimize the effects of a RDD attack, response to an attack). Document 10: Department of State, "Strategic Plan for Interagency Coordination of U.S. Government Nuclear Detection Assistance Overseas," August 5, 2004. Unclassified. As noted earlier, in the event of a nuclear threat to a foreign site the Department of State would be responsible for coordinating any U.S. response. Other agencies with possible roles include the Departments of Energy, Defense, Commerce, and Homeland Security. This plan represents an agreement between those agencies with respect to interagency coordination in the event of such an incident. It specifies strategic goals and objectives, and the roles and responsibilities of each department and organization – and notes the Energy's department expertise with regard to nuclear detection. Document 11: Sara Daly, John Parachini, William Rosenau, RAND Corporation, Aum Shinrikyo, Al Qaeda, and the Kinshasa Reactor, 2005. Unclassified. This study, prepared by the U.S. Air Force, constitutes three case studies of terrorist efforts and opportunities to acquire nuclear or radiological weapons. It is part of a larger project focusing on preventing U.S. adversaries from acquiring nuclear weapons. Document 12: Jonathan Medalia, Congressional Research Service, Terrorist Nuclear Attacks on Seaports: Threat and Response, January 24, 2005. Unclassified. One scenario for a terrorist nuclear attack involves the detonation of a nuclear device carried into a U.S. port by a cargo ship. This brief report examines the damage that could result from such an attack, different means by which terrorists might acquire a nuclear device, efforts to prevent acquisition, and policy issues (including the priorities assigned to port areas and port security, forensics, and limiting economic consequences). Document 13: Gene Aloise, Government Accountability Office,GAO-05-840T, Combating Nuclear Smuggling: Efforts to Deploy Radiation Detection Equipment in the United States and in Other Countries, June 21, 2005. Unclassified. This testimony from the GAO official who is the director for natural resources and the environment focuses on U.S. efforts to deploy radiation detection equipment at U.S. and foreign borders to detect the smuggling of nuclear material. In his testimony, Aloise notes that several U.S. agencies have programs to combat nuclear smuggling, the lack of effective planning and coordination of detection programs, and the limitations of existing radiation detection equipment. Document 14: National Intelligence Council, Annual Report to Congress on the Safety and Security of Russian Nuclear Facilities and Military Forces, April 2006. Unclassified. The security of the Russian nuclear weapons and material has been among the top concerns of U.S. officials responsible for preventing warheads and fissile radioactive material from falling into terrorist hands. This is the latest unclassified annual report on the topic from National Intelligence Council, which reports to the Director of National Intelligence. It examines the security of the Ministry of Defense's nuclear weapons inventory as well as the security of the Federal Agency for Atomic Energy's nuclear materials (addressing detected diversions and safety and security at civilian nuclear power plants). Document 15: Government Accountability Office, GAO-06-1015, Combating Nuclear Terrorism: Federal Efforts to Respond to Nuclear and Radiological Threats and to Protect Emergency Response Could Be Strengthened, September 2006. Unclassified. This study examines the capabilities possessed by several government organizations, including NEST, to respond to nuclear and radiological threats. It makes recommendations with regard to the physical security measures used to protect response assets, the need to evaluate the costs and benefits of conducting radiation surveys of metropolitan areas, and the need for the National Nuclear Security Administration and Homeland Security to work together on such surveys if they are deemed advisable. Document 16: Vayl S. Oxford, Director, DNDO, Department of Homeland Security, Domestic Nuclear Detection Office (DNDO), Presented at EFCOG 2007 Executive Council Meeting, February 21-22, 2007. Unclassified. Source: www.efcog.org (document no longer available). While NEST is an emergency response team of last resort, the Domestic Nuclear Detection Office (DNDO) within the Department of Homeland Security is responsible for trying to devise a global architecture for detecting nuclear material before it falls into the hands of terrorist groups. This presentation by the DNDO director discusses his office's mission and objectives, organization, accomplishments, desired end state, the global nuclear detection architecture, the vision for domestic screening, and several detection programs. Document 17: Department of Energy, DOE O-153.1, Subject: Department Radiological Emergency Response Assets, June 27, 2007. Unclassified. This order replaces the 1991 orders that covered NEST and other Department of Energy response units, including the Accident Response Group (which responds to nuclear weapons accidents). Among the topics covered in the order are Department of Homeland Security operational control of the units in the event of a domestic incident, the role of different response and consequence management assets, and management and administration responsibilities. Document 18: National Intelligence Council, The Terrorist Threat to the US Homeland, July 2007. Unclassified. This document supplies the unclassified key judgments to the National Intelligence Estimate on the terrorist threat to the United States – including the Council's judgment concerning al-Qaeda's interest in acquiring weapons of mass destruction and willingness to use such weapons. Document 19: Dana A. Shea, Congressional Research Service, The Global Nuclear Detection Architecture: Issues for Congress, September 23, 2008. Unclassified. This study examines DNDO, the global nuclear detection architecture (including the layers comprising it, the methods for evaluation, and interagency coordination) and issues for Congress (setting priorities, the balance between incremental and transformational change, long-term maintenance of the architecture, and coordination of research and development). Document 20: Domestic Nuclear Detection Office, DNDO Overview, Summer 2008. Unclassified. These briefing slides offer another look at the structure and activities of the DNDO. They focus on, inter alia, mission and objectives, its personnel, the radiological and nuclear threat, the global nuclear detection architecture, the National Technical Nuclear Forensics Center, and next generation technologies. Document 21: Michael K. Evenson, Defense Threat Reduction Agency (DTRA), Nuclear Detection and Attribution, n.d. The focus of these briefing slides from a senior DTRA official is 'domestic nuclear event attribution' – which refers to the ability to identify the source of any nuclear material used in a nuclear or radiological strike in the United States. The major rationale for the attribution effort is that potential sources of such material would be reluctant to provide such material to terrorists if they knew that their involvement could be detected, thus making them a target for retaliation. 1. Daniel Benjamin and Steven Simon, The Age of Sacred Terror (New York: Random House, 2002), p. 229. 2. 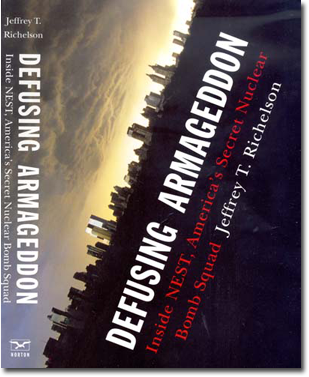 See Jeffrey T. Richelson, Defusing Armageddon: Inside NEST, American's Secret Nuclear Bomb Squad (New York: W.W. Norton, 2009). 3. Benjamin and Simon, The Age of Sacred Terror, p. 229. Contents of this Web site Copyright 1995-2017 National Security Archive. Site design by Jamie Noguchi.